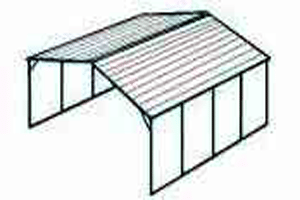 The ideal place for your steel carport, garage, barn or warehouse. Are you planning to get a metal building in the future? Have you considered insulating it? Perhaps insulation doesn’t seem like a huge deal for you, but it’s the best choice for those who want to keep their valuables at room temperature. American Carports offers insulation for your metal building that provides your metal unit with thermal, radiation, and vapor barriers; combining these benefits means that that you will have a cool, dry structure in the summer and a warm, dry structure in the winter. • Has an R-Value of 16. • Offers radiation and vapor barriers. • Is great for heat, condensation, and cold. • Comes with reflective aluminum foil on each side of a 5mm closed-cell polyethylene foam center. • It has a classification A for fire retardant, slow flame propagation material. • It doesn’t leak when fastened. • It’s water-proof. It has two aluminum faces that reflect radiation and heat. • It offers thermal insulation. • It retains its thickness over time. Restrictions: Insulation can only be applied on buildings with Vertical siding; even if you only want to insulate the roof of your metal structure, it must be an A-Frame Vertical roof. You might be wondering why insulation can only be added to vertical buildings. The simple answer is that the extra material used on vertical sides helps to support the insulation, preventing it from coming down or getting saggy. Horizontal siding or roofs wouldn’t be able to hold the insulation correctly due to the lack of material. Now you’ve learned about our insulation and all the benefits we offer. If you’re definitely sure about getting a metal building with insulation, give us a call! Let one of our experts help you create that metal building of your dreams. And don’t forget to ask about what financing options are available for you. 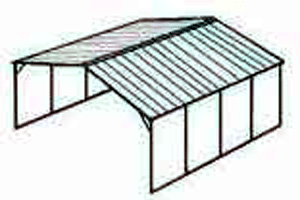 A major difference between a Horizontal (regular carport) and a Vertical Carport is that the ridges on the steel panels in a horizontal roof run parallel to the side of the building, and the ridges on a vertical roof run vertically (or straight down towards the ground (meaning they intersect with the side of the carport (side wall or frame). 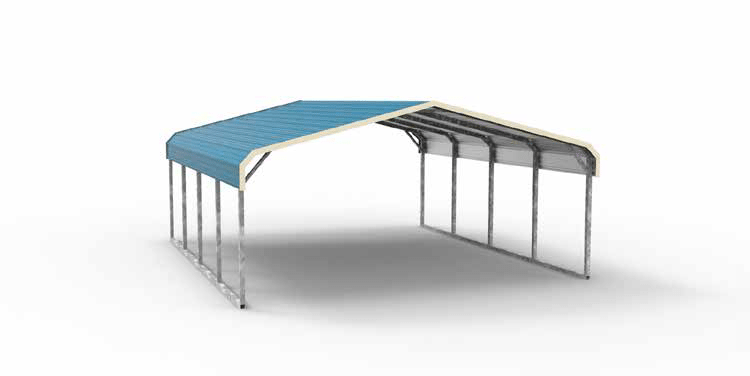 There are three different types of Buildings systems for our metal carports, and all our metal structures. They are regular style, boxed eve style, and vertical systems. On a vertical system the ridges of the steel panels run from the top of the carport where the ridge cap is installed to the bottom (straight downward). 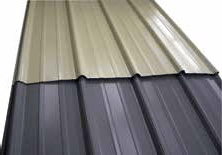 The panels are also shorter on a vertical system with each panel being half the size of the width of the total roof, and strengthened with steel channel making for an overall stronger system. This is our best system. A Vertical System displaces water, and snow much more efficiently than a horizontal roof. The water will also drain away from the door openings unless the placement of the doors are on the sides of the building. Roof panels that are installed horizontally are more cost effective but they are inclined to hold more water, snow, or debris. Often called the Standard Wrapped-Corner style or commonly called Horizontal roof. This Carport comes with a Standard Horizontal Roof. This means that the Roof Panels are installed horizontally and run parallel to the side of the carport. On a horizontal roof system water will run along the length of the ridge and drain to the front and back of the roof at the end of the panel.